Let's be honest, none of us like cleaning. So when robot vacuum cleaners started appearing on the scene a number of years ago, the idea that we would never have to do any vacuuming again got a lot of people excited. The problem is most robo-vacs don't work that well. You'll end up looking at your floor afterwards wondering what the little robot has been doing all that time. And unless you've got a cat in a shark suit chasing a duck, the humour soon runs dry. The Dyson 360 Eye is the company's robotic vacuum cleaner that promises to beat the likes of iRobot's Roomba, Samsung's VR7000, and Ecovac's Deebot R95 MkII models. Can we, finally, give up cleaning forever? The Dyson 360 Eye is small but tall meaning it can get into tighter corners than any other robotic vacuum cleaner we've tested before. That height though does stop it going under certain bits of furniture. It's tall rather than wide because of the size of the digital motor tucked inside. It's a variant of the same power motor used in the company's cordless V8 range and the company's Supersonic hairdryer, but adapted slightly for the requirements here. In our home the 360 Eye was still able to get to most places you would expect it to be able to clean. The cleaner itself is very "Dyson" in look and feel. Robust and well built, it can be easily dismantled to clear blockages, access the filter, or empty the dust bin. Flipping it over reveals the large brush bar to suit all floor types and the robot's two tank-track wheels that allow it to navigate varying floor heights like carpets or door runners. Unlike other robotic cleaners the Dyson's brush - which is made from stiff nylon bristles and softer carbon fibre filaments - dominates the width of the design, ensuring it can clean as wide an area as possible. As such the 360 Eye can get very close to skirting boards or objects, without needing one of those not-so-useful "flick" brushes of the competition. There's a big start stop button on the top with the rest of the controls, including scheduling functions, accessed via the accompanying app. When in need of a charge the Dyson 360 Eye returns back to its simple-looking white docking station about the size of a A4 piece of paper, which sits against your wall by a plug socket. Rather than use a series of lasers to bump its way chaotically around the rooms of your house the 360 Eye uses a camera sitting on top to help it locate itself at all times as well as help it find its base station to recharge after it's used up its 40-minute battery. The use of a camera has its negative, though: without good light the 360 Eye struggles to work properly. Unlike other cleaners, the 360 Eye drives to the centre of the room and then creates a snail shell-like shape until everything is clean. You never get to see what the camera sees, but you do get a detailed map of what your robot has and hasn't been able to clean. A year later and this cleaning process still works a charm. The eye means it doesn't bump into the family dog, and if you are keen to force it into a certain room can easily put shoes in the way to help guide it to your chosen destination. The Dyson 360 Eye is fantastic at cleaning. Wave goodbye to regular dirt, dog hair, and various detritus. We've been testing the robot cleaner over a number of surfaces ranging from carpets and shaggy rugs, to tiled areas with a range of obstacles left in the way for well over a year. In most cases the 360 Eye managed to navigate around the array debris left in the way - we have three kids and dog, so you can only imagine - and still get on with the cleaning at hand. A towel or sock will still jam the cleaning brush fairly easily, while stray Lego can also cause problems. We've found for best results you have to do a quick scan of the house to make sure the floors areas are clear. The camera feature also allows it to move from room to room (you have to leave the door shut if you don't want it to escape) and the range of sensors on board means it won't throw itself off the top of the stairs like a robotic lemming. Like all robot cleaners, the Dyson 360 Eye isn't perfect in every room or every situation. You need to remember to empty the dust bin regularly, the app will ping you so you don't have to watch it, and you will still need a vacuum cleaner for the stairs, for spot cleaning, and for more intricate nooks and crannies - not to mention high-up places. For general maintenance cleaning, though, we've been more than happy with the performance. Rather than insist on punching in a series of commands via a handful of buttons on the cleaner, the 360 Eye's setup, scheduling and monitoring is actioned via the accompanying iPhone or Android app. The scheduling tool lets you set individual day cleaning programmes, so you can have a different setting at the weekend or on a day off. However, clean freaks will be disappointed you can only set it once daily. There is always the manual activation option. The app also shows you a map of the area your robot has cleaned, where it wasn't able to get to and, if you zoom in, the path it took to clean your room. It's basic and fairly dry - it would have been fun to see some animation here. If you have an Amazon Echo in the house you can connect your robotic vacuum cleaner with the Dyson Skill. It will let you issue a series of commands including switching between Max and Quiet mode, to start or pause cleaning, or check the current status. The Dyson Skill is basic and in line with Sir James Dyson's thoughts on the Smart Home, but it's a great addition. The Dyson 360 Eye is pricey, there is no denying that, especially against the competition. Its £799 asking price is more than most other robo-vacs. However, it's markedly better than its competition so, pound for pound, we believe it's worth it. While buying a robotic vacuum cleaner isn't your ticket to never having to do any vacuum cleaning again, for what it's designed to do, the results are impressive. 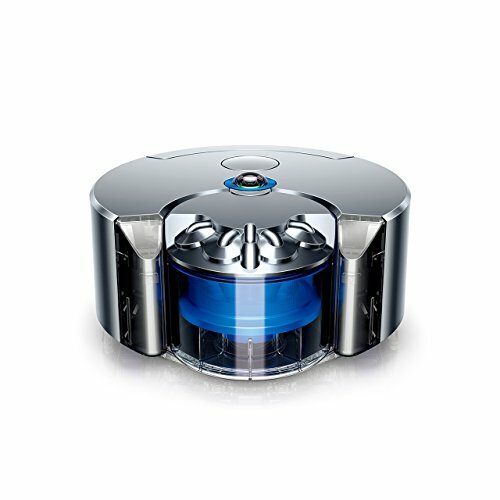 The Dyson 360 Eye is, in short, the best robotic vacuum on the market to date. We're mighty impressed, although given that Dyson has just launched a new and improved motor that will fit in its V10 Cordless model, we would expect a new 360 Eye model with an improved motor to appear some time in 2018/2019. This review was originally published 7 July 2016.